I think, that very early cartomancy notes should be included in the timetable, as you have already Casanova 1765, Bologna 1750 etc. ... a Lutheran pastor with a lot of esoteric interests, but cartomancy he considers as "töricht" (stupid). He is called a "Wolffian", which means, that he followed ideas of Christian Wolff, a German philosopher. It appears to use a grid like layout, significators, and the influence of the cards surrounding the significators. ... a note about a Kartenloosbuch in 1543 by Cammerlander. John Meador had noted it once years ago. I present it in the thread "Cartomancy in Germany". These lists might offer some help, when analysing the various editions of PODD !!!! I found a passage for "Oliver Goldsmith in "The Vicar of Wakefield" 1762-63 ... page 170" .... it's at the end of chapter 11, I don't know, if that's page 170. My wife approved her suspicions very much, observing, that she was very apt to be suspicious herself; but referred her to all the neighbours for a character: but this our Peeress declined as unnecessary, alledging that her cousin Thornhill's recommendation would be sufficient, and upon this we rested our petition. Huck: I did mention Ross's article, except in the online edition in English. However I buried it in the post about Bologna. So I will make a separate entry for pre-1738, at the very beginning giving the links to Ross and Mary Greer there, and your posts about Germany, too. I think in an Etteilla thread we only need separate entries, as opposed to general links, after 1738. So I will put in the one for 1752 for Kwaw. I already had the 1759 from Ross. I will put in a link to your 1760s Germany, and notes about England post 1738, even though Greer already covers them. I am unclear about whether those lot-books you mention, Wickram and the 1543 German one, involved cards in particular. I didn't see the word "karte" in your source. Lot-books go way back, to ancient Greece, and were used all through the Middle Ages, mostly with dice. They don't have to be given any special mention, I don't think. An even more Egyptianized version is in the British Museum. (28) Etteilla's designs for cards 1 and 8 have been replaced by an ancient Egyptian with a staff and an Egyptian woman surrounded by implements of divination; cards 2, 3, and 5 are lebeled with the names of Osiris, Anubus and Isis, and Apis and Horus; most of the court cards have acquired Egyptian personalities and Egyptian names. 28. F 85 in Wilshire's catalog; cf. F 21 in O'Donoghue's catalog; for illustrations, see Kaplan, op cit., p. 143. Kaplan does have illustrations of some of the cards. He describes it as "Etteilla (?) 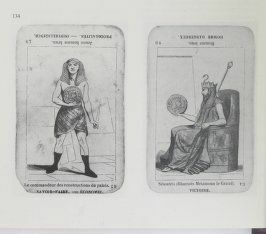 Tarot Cards, cica Nineteenth Century". It is labeled "Collection of the Author". Looking online, I see a couple of cards of the same style on Pinterest, given as "Tarot « Égyptien » - Grand Etteilla. France, troisième quart du XIXe s. Catalogue de l'exposition « Tarot, jeu et magie », Bibliothèque nationale, Paris, 17 octobre 1984 - 6 janvier 1985. Gallica. These cards are indeed shown in Depaulis's catalog, p. 136, no. 134, which he does give as 3rd quarter of the 19th century. He gives the same page number in Kaplan as Dummett, but Depaulis says it is "B. N. Estampes K. H. 383 no. 274". He classes it as a Grand Etteilla I. All the cards are reversed left to right, he says, and the motifs are Egyptian/Assyrian. No information on date or manufacturer. Have we linked to this deck? Ah, yes. 1843, and I see that it is covered in the timeline on this thread. Thanks.